Click here to view the solution for Star Sudoku puzzle 20 - Easy Star Sudoku. I hope you managed to solve it and had a lot of fun trying to do so. Solving a Star Sudoku puzzle is really fun for the brain. Try it and enjoy! How to play Star Sudoku: Star Sudoku consists of six large triangles. You must place the numbers 1-9 into the triangular cells of each large triangle. Every line, even an uncontinuous line, contains every number only once. The row on the outer edge of the grid includes the cell on the nearest sharp end of the figure. 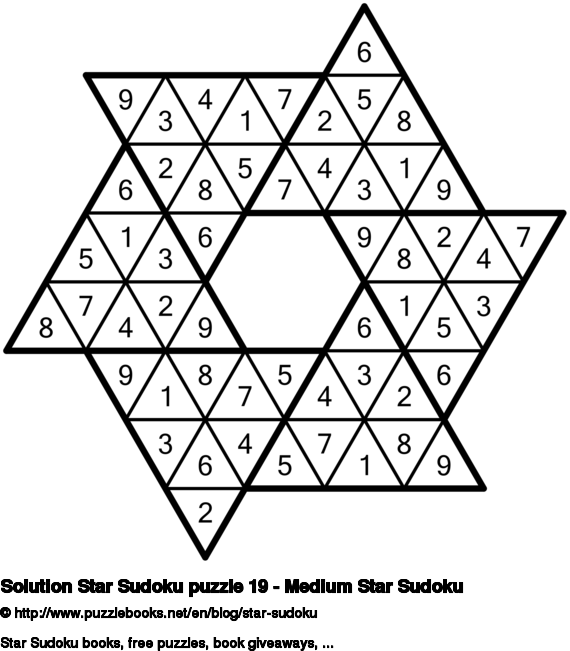 Click here to view the solution for Star Sudoku puzzle 19 - Medium Star Sudoku. I hope you managed to solve it and had a lot of fun trying to do so. Looking for free online Star Sudoku puzzles? Today we have another Star Sudoku puzzle for you. It will give you a couple of minutes of entertainment. Click here to view the solution for Star Sudoku puzzle 18 - Medium Star Sudoku. I hope you managed to solve it and had a lot of fun trying to do so. Click here to view the solution for Star Sudoku puzzle 17 - Medium Star Sudoku. I hope you managed to solve it and had a lot of fun trying to do so. Click here to view the solution for Star Sudoku puzzle 16 - Medium Star Sudoku. I hope you managed to solve it and had a lot of fun trying to do so. Addicted to Star Sudoku puzzles? Today I have another Star Sudoku puzzle for you. Lots of pleasure trying to solve it.